This section covers a wide range of resources for readers to take further their interest in Victorian cinema, or Victorian life as reflected through the projected image. Follow the links on the left-hand menu for individual sections. 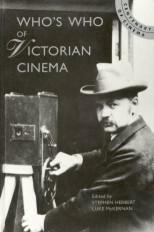 Featured here are a number of texts on Victorian cinema, both original articles and essays from present-day scholars. We are keen to expand this section, and welcome suggestions from interested readers. All texts are reproduced with permission (where this is required). The texts are in PDF format, requiring the free Adobe Acrobat Reader. Facsimile of undated pamphlet (probably early 1895) from the International Kinetoscope Company advertising the Edison Kinetoscope, on show at 83 Regent Street, London. From a private collection. This is the text of a talk given at the 'Biograph Day', organised by the AHRB Research Centre for British Film and Television Studies, May 2001. The day presented work relating to the British Mutoscope and Biograph Company, and the talk here places Biograph - producers of both large-format films for theatrical presentation and small-format flip-card systems for domestic use - within the context of early cinema studies. This article is from the American journal Harper's Young People, dated 22 May 1894. It explains Edison's new inventions, the Kinetograph camera and Kinetoscope viewer, with a surprising amount of detail for its intended young audience. The first Kinetoscope parlour had opened at 1155 Broadway, New York, the previous month. The film illustrated is Highland Dance (aka Scotch Reel). These are the only images of a film that is otherwise lost.